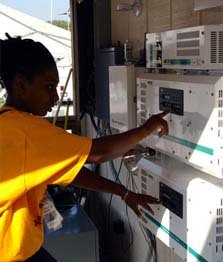 A Tuskegee University student works on her team's power conditioning equipment. The Energy Balance Contest challenged the 2002 Solar Decathletes to demonstrate that the sun could supply the energy needed to meet the demands of a small household and home-based business. Therefore, all electrical energy use in their homes affected this contest.